The Hyundai Santro was always India's favourite family car, and is now back after a hiatus. It always primarily went up against the Maruti Suzuki Wagon R. Yes the new Santro isnt really a tallboy, and the Wagon R has returned with a capable new generation. Which one stands taller? The Maruti Suzuki Wagon R has just been launched in an all-new avatar. The 3rd generation car now uses the 'Heartect' platform like the Swift, which makes it bigger, more dynamic and safer too. Moving the Wagon R into the modern era and yet allowing it to retain its brand strengths was Maruti's primary motive to design an India-specific bigger Wagon R. But that was also almost exactly what a certain other player had in mind too, isn't it? Yes it was a similar intent from the Korean rival with the Hyundai Santro too. Now when the Wagon R nameplate first arrived in India way back in December 1999 it was the car that Maruti was sort of taking a bit of gamble with. It was the quintessential tall boy, but was coming at a time when another car had already taken that benchmark position for tall boys. I am of course referring to the first gen Hyundai Santro. Now isn't it interesting that the third generation of the Wagon R comes to us at a time, when we have a brand new Santro also having only recently arrived in the market? 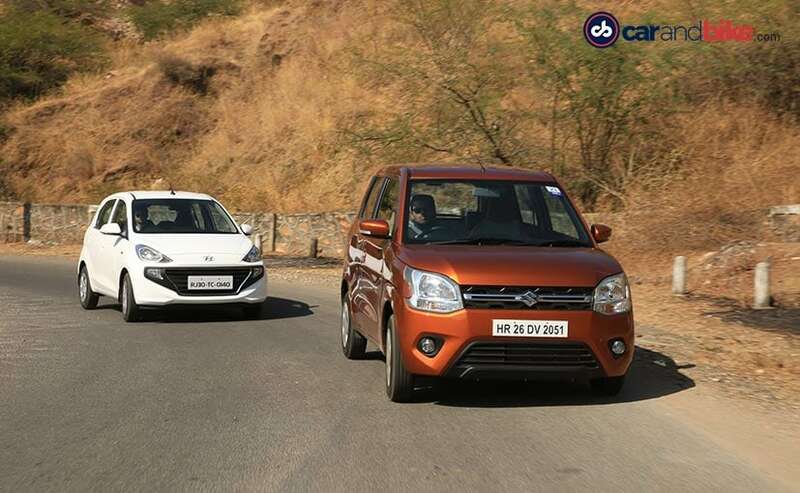 Now I admit there was a time when the Santro really took on the Maruti Suzuki Zen, because the Wagon R in its first generation was not initially a massive success. But the two tallboys quickly squared up as adversaries soon after. The only big difference this time around - is that even though Hyundai calls it one, today's new age Santro is a not-so-tall tallboy! Both iconic nameplates, and yet from the very first cars we've got to now, they have both moved up big time. Yes these are much more modern, better built, better equipped cars that drive a lot better too. But styling wise, I have to say, both of them have taken a sort of backward direction in a way! With the Wagon R it's intentional, it's trying to look like a Wagon R - so it's intentionally squarish and boxy. But in the case of the Santro, you have to ask the question - why?! After Hyundai's recent design successes, the Santro's looks have been underwhelming. The Wagon R on the other hand builds on the car's boxy appeal, and takes it into a modern interpretation for the first time. The muscle is not forced - with the lines all working. The same is true for the face (headlamps and grille) and tail (broader tailgate and well designed vertical lights). On the Santro the lines in the metal appear forced; and the lights are well - boring. There are few bits that are nice and modern, so you do have the cascade grille in the front, very European looks, but it is not drop dead gorgeous! In terms of proportion, here's the interesting thing - the Wagon R looks nice and tall, and the Santro looks nice and wide. 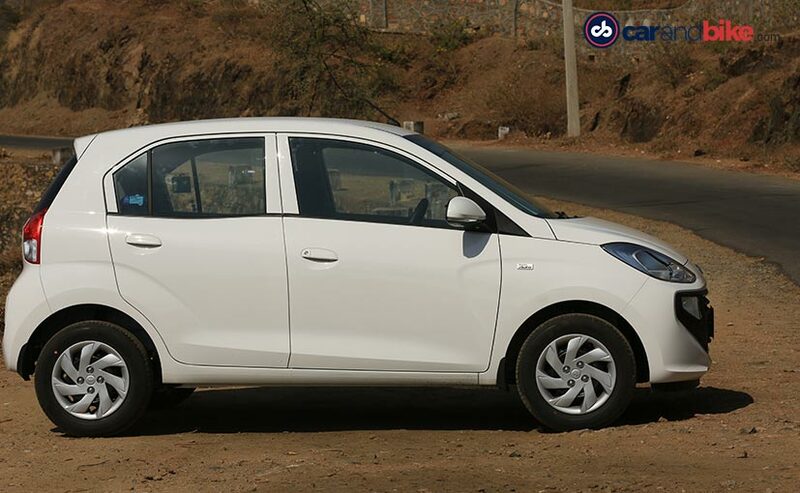 Hyundai's played it smart with the Santro by bringing in a powerful petrol engine. It gets a 1.1-litre petrol motor which is good enough for 68 brake horse power and the torque figure stands at 99 Nm. There's also CNG on offer and that sees power drop slightly at 59 bhp, which is good enough for a car this size. Maruti is big on options too. There are two petrol engines on offer - the 1 litre K10B and a more powerful 1.2 K12M. There's no CNG available yet but Maruti promises that there's one in the pipeline. The 1 litre motor produces 67 bhp but the 1.2-litre version produces 83, and torque stands at a massive 113 Nm. The larger engine has more power and is the familiar K12 series from some of the other Marutis we know. But it's been tuned more for efficiency than performance. With the two petrol engines Maruti certainly gives customers a choice, as per their preference. There's more choice in transmission options too as both engines get a 5-speed manual and a 5-speed AMT. The Santro too gets the option of a 5-speed manual and an AMT but the CNG variant does not have AMT. 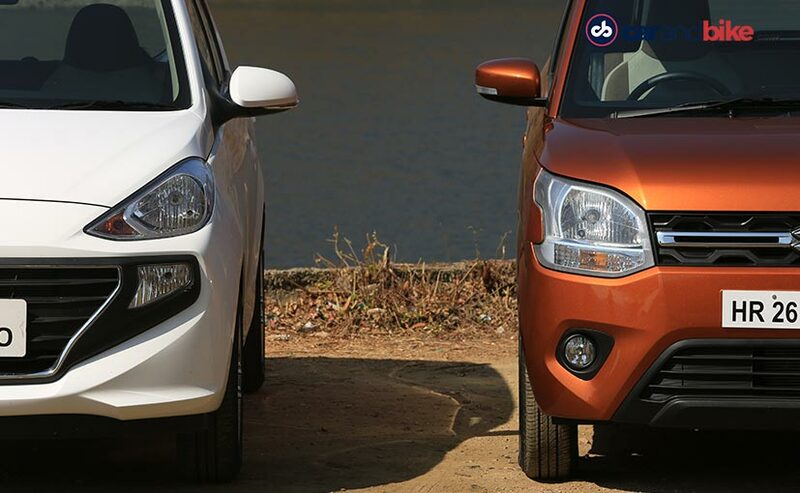 In terms of fuel efficiency the Wagon R has the upper hand as both the engines are more fuel efficient than the one in the Santro. 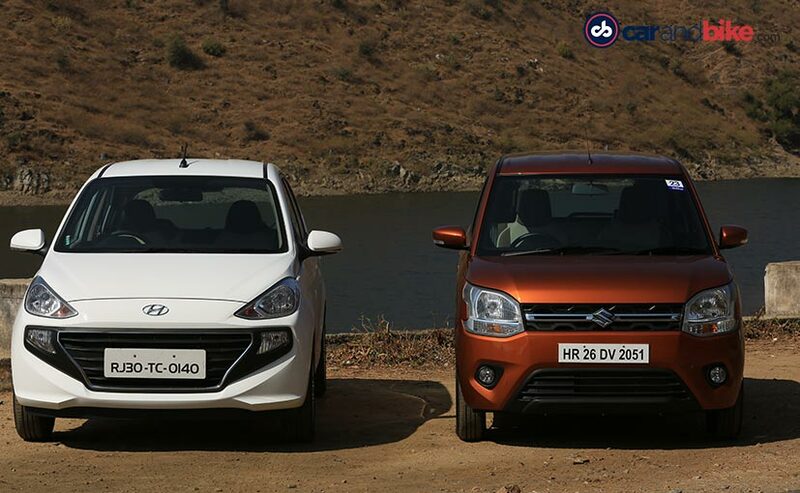 21.5 and 22.5 kmpl respectively, compared to 20.3 kilometres per litre in the Santro. On to the drive next. We want to really test the cars with their combined USPs at the fore, and which is why both our rivals here sport AMT gearboxes. 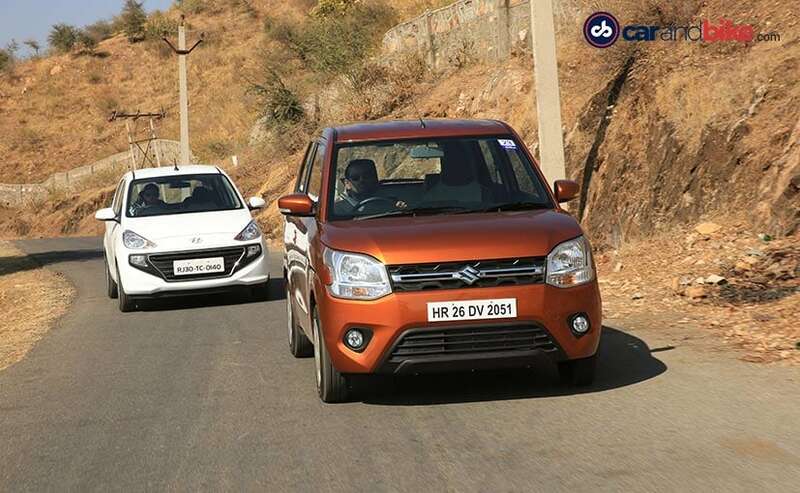 So while the Wagon R is in its highest trim - the ZXI, the Santro has the Sportz, one below the highest - which is as high as you can go with the AMT. So then, first up the newer car. The stance of the Wagon R is impressive, the seating positing, the nice view of the road - this is something that a lot of people are going to appreciate about the car. First, it will impress you on ingress and egress, and then it's the fact that on the road too, you get a good sense of control. Now having said that of course you also have to acknowledge the fact that all Maruti cars off late have been leaps ahead of some of their previous generations or versions. By that I am hinting at not just engine performance or the gearboxes, but more importantly the overall built quality. I mean these cars handle a lot better, and that is primarily because they are built a lot stiffer now. That said the steering still lacks feel as I've said in my review, and the new 1.2 litre K12 engine has limited punch. Now the Hyundai Santro. Now straight away it's a huge difference. The character of both the cars is immensely different from each other. While on the Wagon R you have that slight exaggerated almost commanding height, here you don't get that. But you get a sense of the width, so it's a lot more comfortable to drive, and it has a bigger car feel for sure. The ride quality on this car is something I think Hyundai has really cracked. Also very nice is the AMT, the performance of which cannot be dismissed; because it is hands down the smoothest AMT on the block. And that certainly bodes well when you think about Hyundai's upcoming product like the QXI or Styx - it's subcompact SUV. So while the Wagon R scored on looks the Santro takes it on performance. On the inside the cabins are similar in colour palette and equipment. Both cars have multifunctional touchscreens. But the Santro has power window controls up front placed under the gear shift. 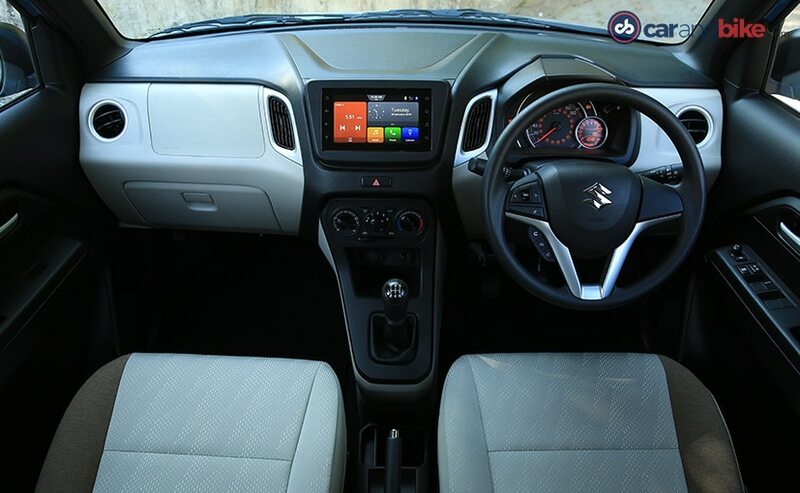 Its screen is good, but the Wagon R debuts Maruti Suzuki's brand new Smartplay Studio interface that's more advanced. You can marry in 3 devices at a time, use its own navigation and also still get the Apple CarPlay and Android Auto like functions. 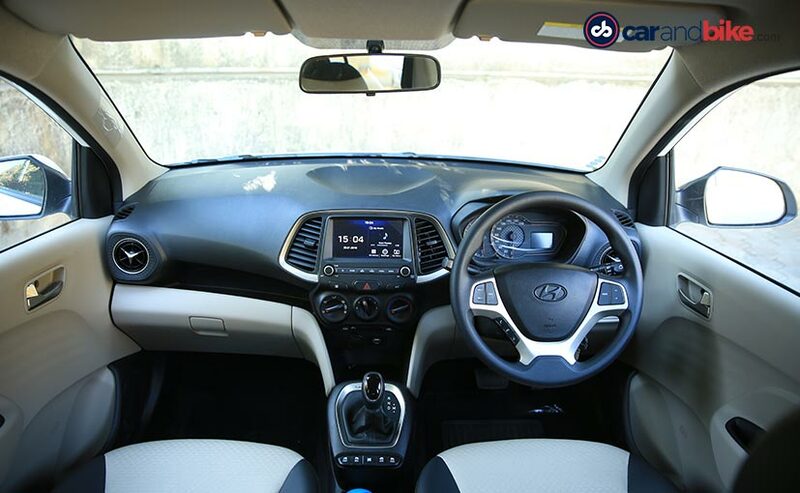 Plus the freshness of the cabin is more evident even though Hyundai is better on plastic quality on the Santro. 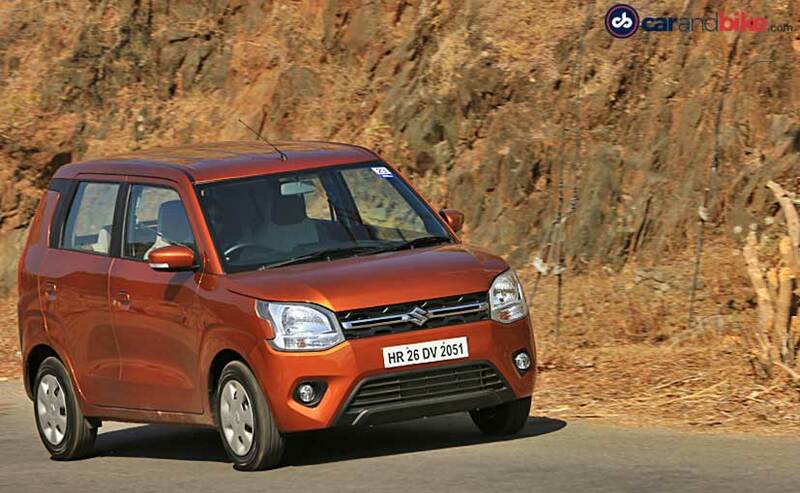 The sense of space the Wagon R has and conveys is also miles ahead of the Santro. The latter's seat at the back is wider but the headroom and legroom on the Wagon R is undeniably bigger. Both cars get decent safety equipment but the Wagon R has dual airbags as optional on every variant while driver side is standard. Rear parking sensors and central locking are standard. 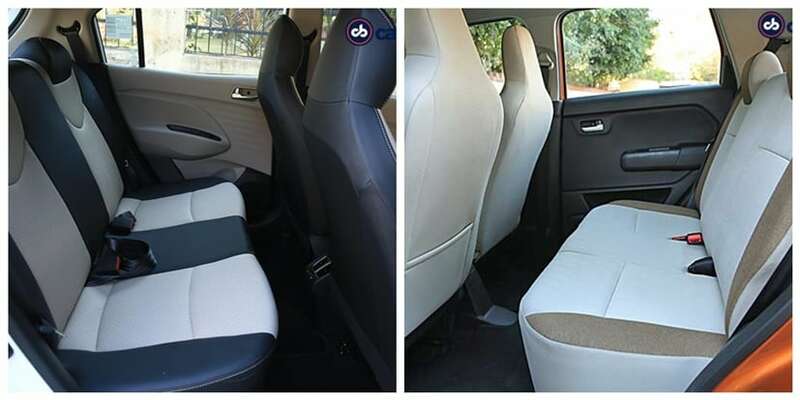 The top trim ZXI option is also available on the AMT - on the Santro that's limited to the Magna and Sportz variants. This is a sore thumb for the Santro for sure on both counts where you can only get the dual airbags and parking sensors only on the top Asta trim. Driver airbags and ABS are standard across variants. And that is why the prices are not an accurate reflection of what you get for that money. The Wagon R's lowest spec's the 1 litre and starts at ₹ 4.19 lakh. That goes all the way up to ₹ 4.69 lakh. The AMT costs ₹ 5.16 lakh. The more powerful 1.2 version starts at ₹ 4.89 lakh, going all the way up to ₹ 5.69 lakh. The Santro holds an advantage here, because it undercuts the Wagon R by a little more than ₹ 30,000 on the base variant. With 5 variants on offer prices for the Santro start at ₹ 3.89 lakh, and run up to ₹ 5.64 lakh. The AMT variants of the Santro are priced at ₹ 5.18 lakh and ₹ 5.46 lakh. Though remember there's no top trim AMT. So it's interesting how the two cars square up. On some things it is the Santro that goes ahead. On some, it's the Wagon R. But that is the nature of the game. And so let's just get down to brass tacks. When it comes to ride quality and the quality of the AMT per say, yes it's the Hyundai Santro, there is absolutely no dispute on that. So if it is performance you really care about the Santro is your winner. It's also very good value especially for some of the starting prices, But let's be pragmatic: who really buys the base version anymore? Not too many people! And it's not as if the Wagon R has much higher prices. Frankly on value, I think the two cars are reasonably matched. 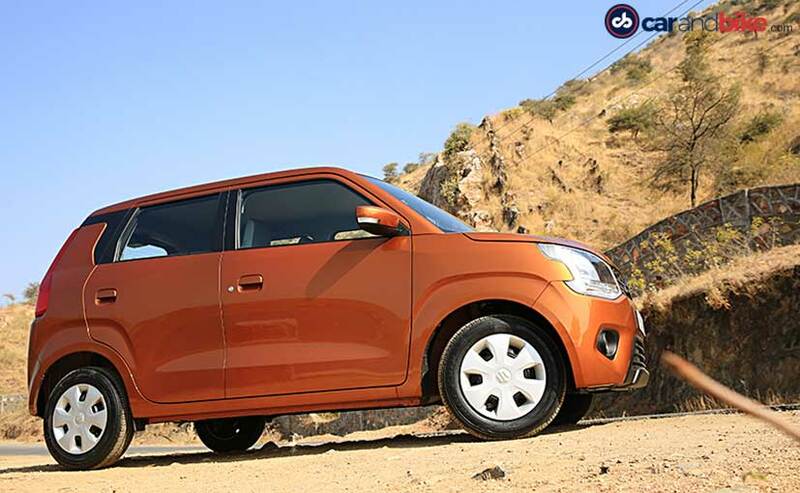 And so for its better looks, well-appointed cabin, better features, bigger space and overall a better portfolio of safety equipment, the Maruti Suzuki Wagon R takes this one! 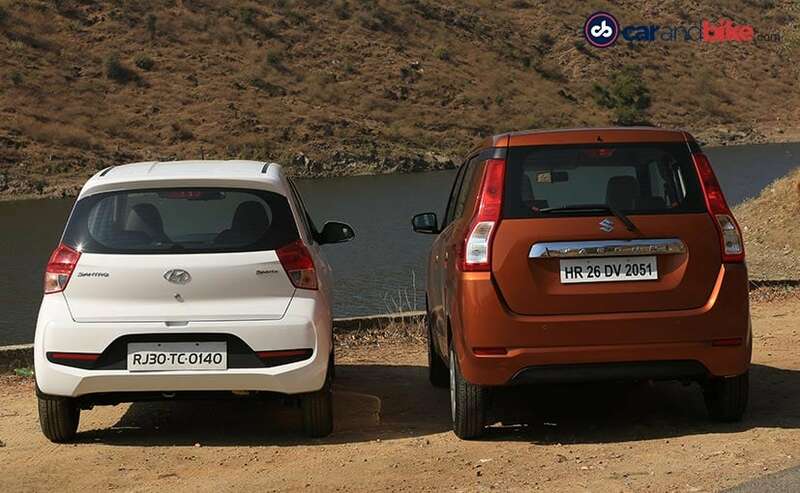 Surprising, because whenever these two cars went head to head several years ago - it was always the Santro that won. But now Maruti has got it right.